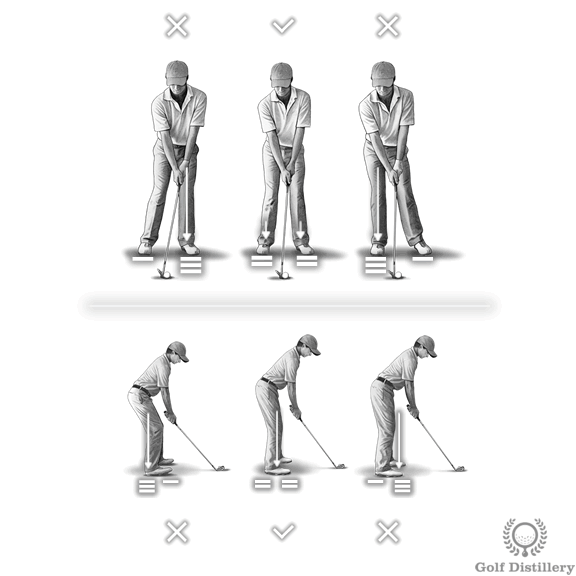 Use the golf tips on this page to improve your golf setup and address position. 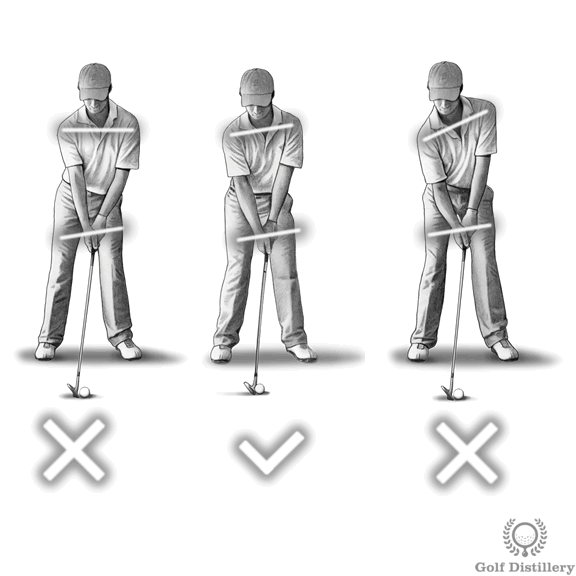 A good setup will allow you to start your swing correctly but inversely, a bad address position will hold your swing back. At address, the ball will be located in front of you, somewhere in between your two feet. It will normally be located in the middle when using a short iron and progressively towards the front foot as the length of the club increases. 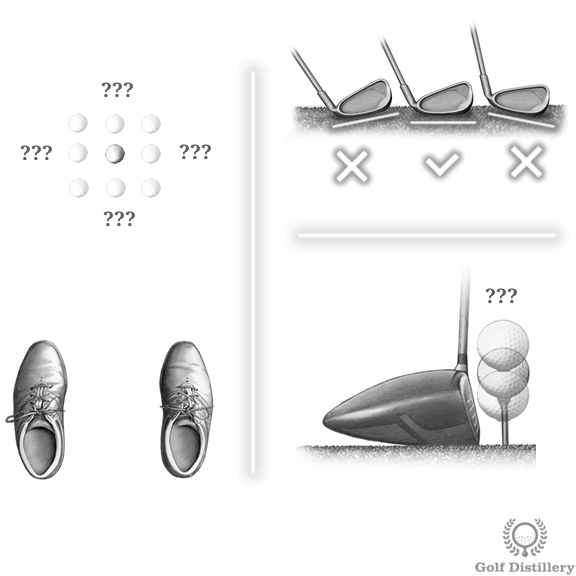 The ball will be located away from your body in such a way as to allow the sole of the clubhead to lie flat on the ground. 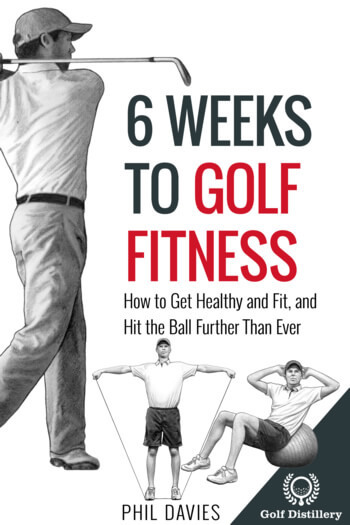 As such, the ball will be closer to you when using a short club and will move progressively further as you use longer clubs. 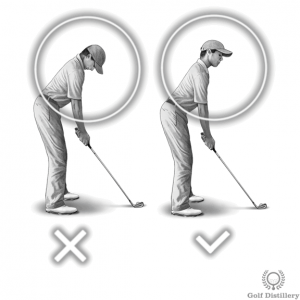 When positioning the ball on a tee, the ball should be held so that the middle of the ball – or its equator – is as high as the crown of the driver. When using an iron with a ball on a tee, the ball should be held just off the ground to ensure a perfect lie. Your feet should be positioned apart from each other in a way that is coherent with the shot at hand. 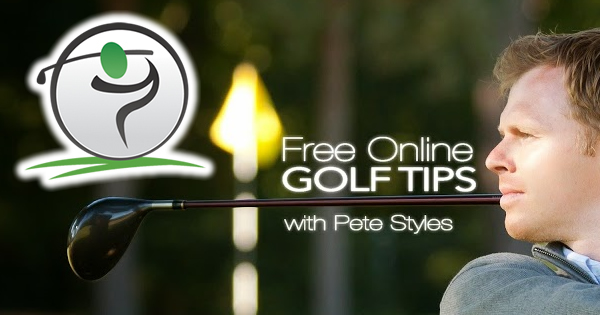 Indeed, for shots using a longer club such as a driver, your feet will be spaced out further than they will when hitting a shot using a shorter club, such as a wedge or a short iron. The amount of foot flaring will depend on the preference of the golfer. 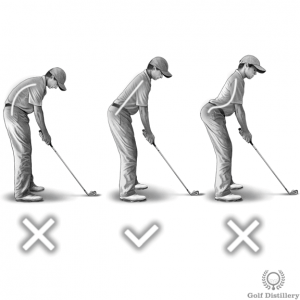 Indeed, some will prefer to flare their left foot, or both, while others will prefer a perfectly perpendicular stance to the target line. 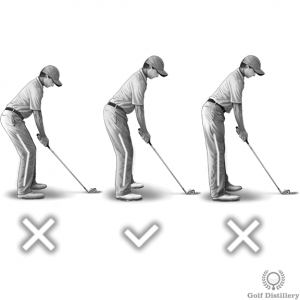 The line formed by your two feet and specifically how that line is positioned relative with the target line is called the alignment. For straight shots, your stance line should be parallel to the target line. For a precise target located very far into the distance your feet can appear to be aligned towards the target by ideally they will point slightly to the left of the target, by an amount equal to the distance from your feet to the ball. 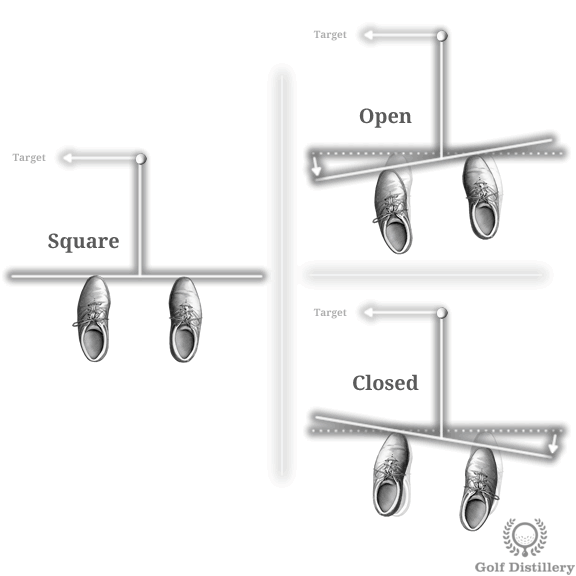 Indeed, being parallel to the target line, the line of your feet should not be pointed straight at the target itself, but just off of it. In normal situations your weight should be distributed equally among your two feet at address. That is, 50% of your weight will be supported by the left foot and the same amount by the right foot. Inside your feet themselves, the bulk of the weight will be found mostly in the middle of your feet. It should not be supported mostly by your toes nor by your heels. The face of the club should be positioned directly behind the ball at address. 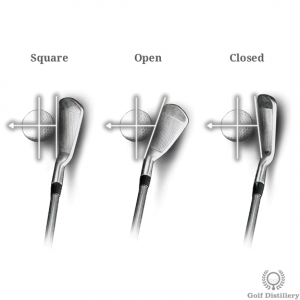 The line formed by the clubface should be perpendicular to the target line for normal, straight shots. 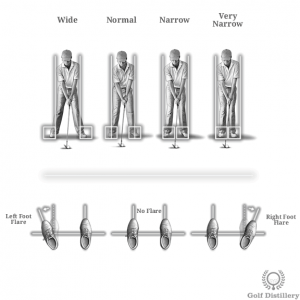 Type: For most golfers, the club will be held by hands that are positioned in an overlap grip. 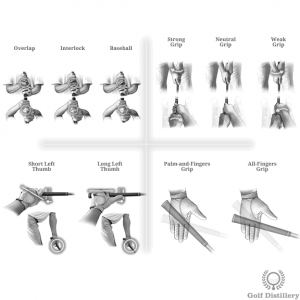 That means that the small finger from the right hand will be placed on top of the left hand, in between the knuckle of the index and middle fingers. Strength: The strength of the grip will tend to be one near neutral. 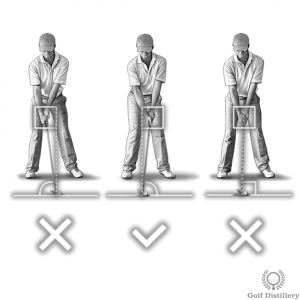 This means that both thumbs will be placed on top of the grip of the club. 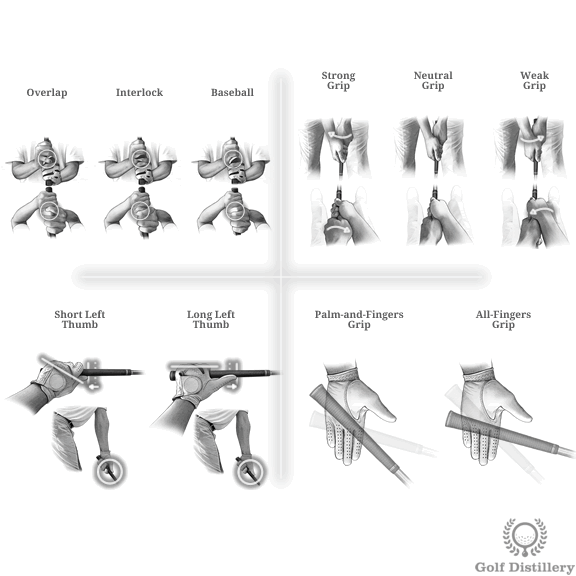 Left Thumb Length: And finally, golfers will have the choice of using a long left finger grip (which leads to an all fingers-grip) or a short left finger grip (which is associated with a palm-and-finger grip). 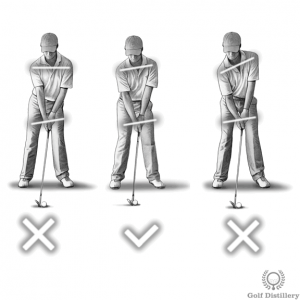 Ideally in a proper setup, the hands will be located ahead of the ball at address. 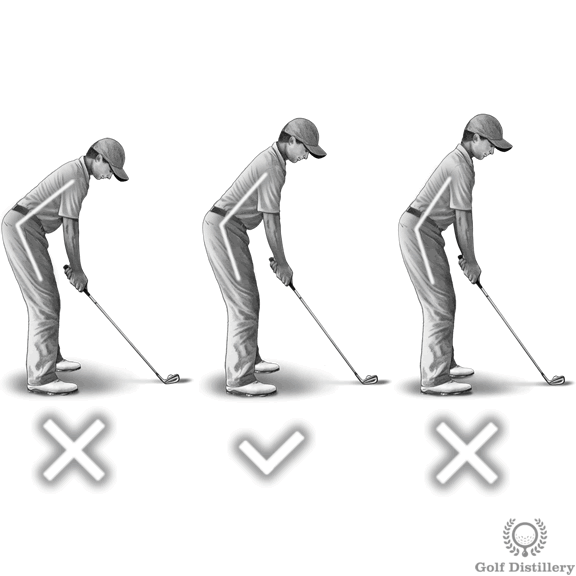 This will have for consequence that the shaft of the club will be slanted forward in what is called a shaft lean. 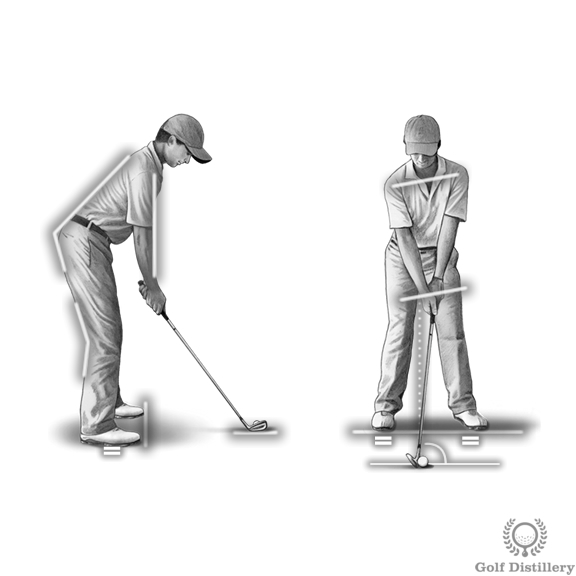 This will facilitate getting back to this ideal position at impact and should lead to a successful trapping of the ball. 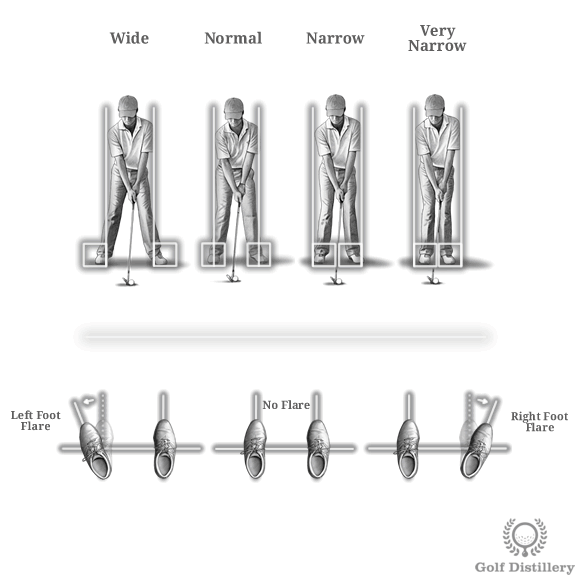 Knees should be bent slightly in what could be described as an athletic stance. 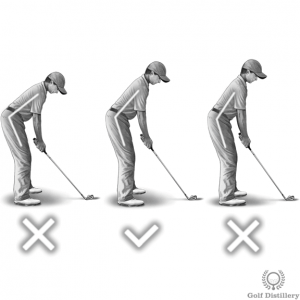 Indeed, knees shouldn’t be locked straight nor should they be bent as to lower the upper body too much. They should be set in a position that allows for the hips and shoulders to rotate freely while keeping you soundly on your feet. 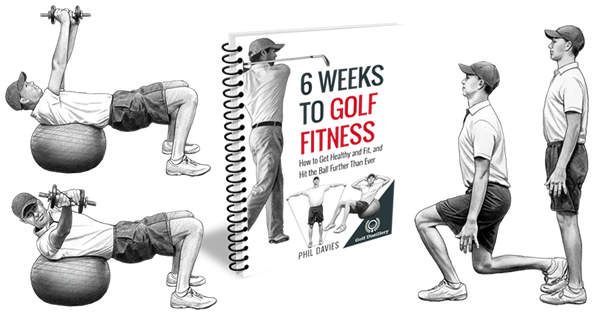 Your upper body should be tilted forward at address. Indeed, the spine angle should create enough distance between your hands and your hips so that your hands can move freely. However, it should not reach the point where it creates tension in the lower back or move your body weight towards your toes. The spine itself should be pretty much in a straight line. While a certain level of variation is permissible at the top, near the shoulders, it should not follow other troublesome patterns such as the buttocks sticking out too much or the back being rounded in an exaggerated fashion. 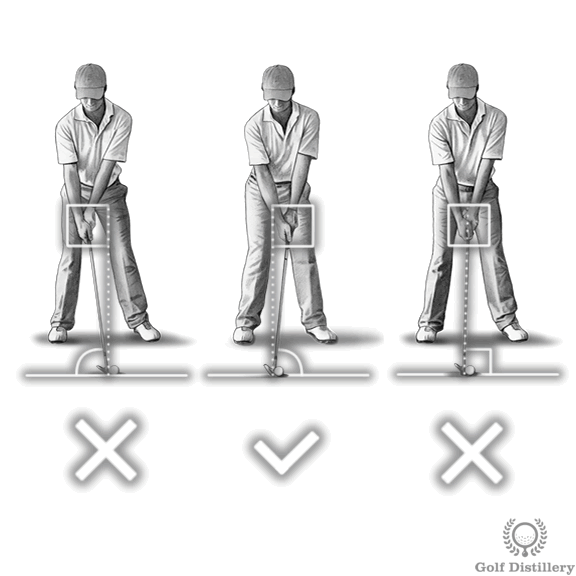 Because of the way the hands are positioned on the grip of the club – the right hand under the left hand – the shoulders should not be perfectly parallel to the ground. 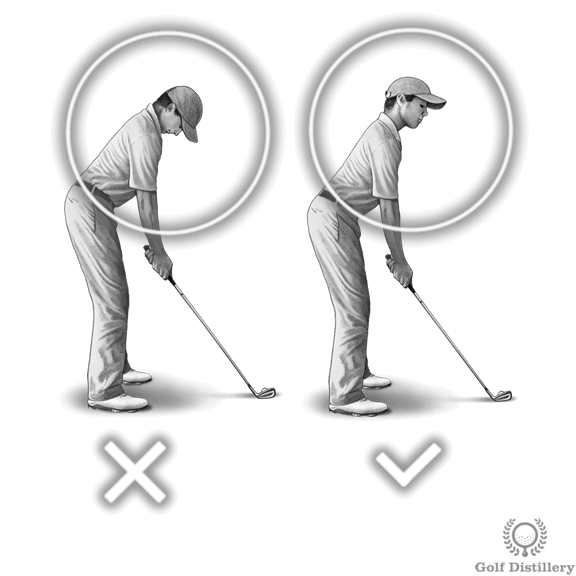 Indeed, the right shoulder should stoop lower than the left. 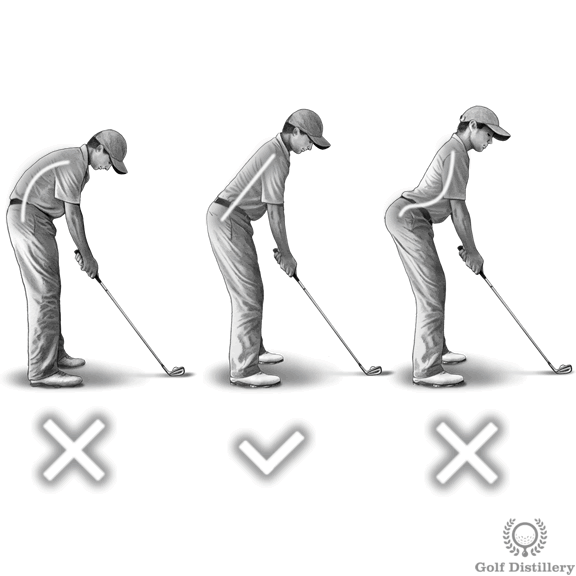 Finally, the chin should be positioned in such a way as to not interfere with the body while swinging. Indeed, by moving it out you will be making sure the chin does not restrict the movement of the arms nor the shoulders as they rotate around your spine.